I freaking love this colour. I believe it's a Canadian Exclusive, that's what I keep hearing anyhow. I can't quite tell what kind of purple it is, but here are the pics. The sunlight one makes the polish out to be a little bit more red than it actually is. I swear it has blue and red shimmer in it. Not a lot, but enough that you sometimes see it. Just fantastic. Two coats. Fantastic application. I like it when polishes have a shorter brush like these Sally Hansen salon brushes. Other than that, I don't have much else to say. Hope you like it! Boy, I picked a good one =) Too bad also one I can't get =( No fair LOL. 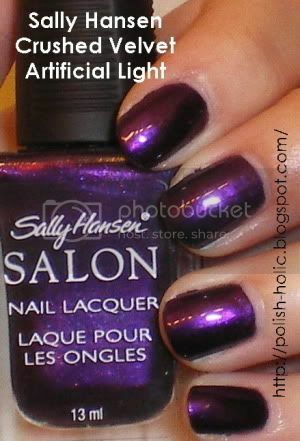 This is a really great purple (& I know my purples)! It really is a fantastic purple. I'm not entirely sure it's a Canadian Exclusive though. How sure are you?